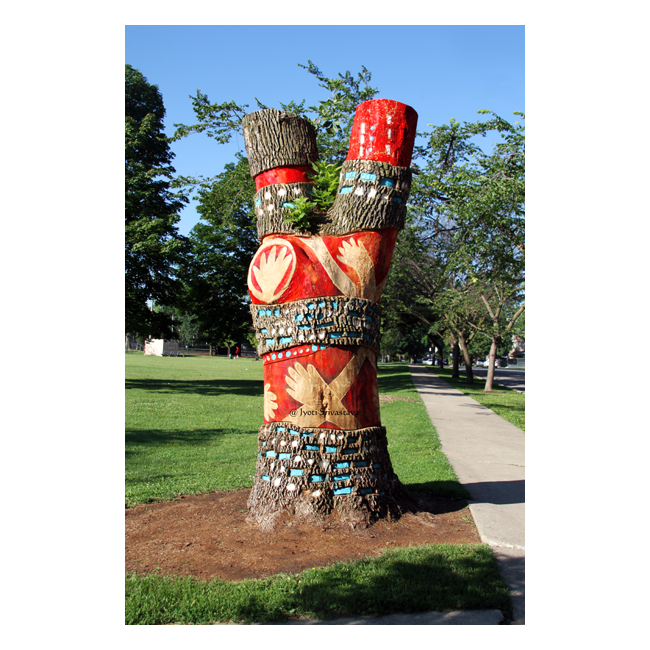 The Chicago Tree Project is part of Mayor Emanuel’s efforts to bring public art to neighborhoods across Chicago and fits into his citywide vision for art and culture, as outlined under the Chicago Cultural Plan. 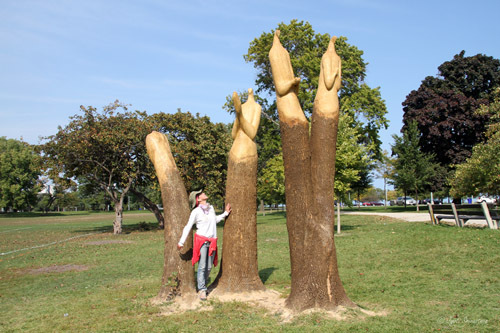 Art as vehicle for community engagement throughout Chicago parks and creates unique opportunities for citizens to celebrate the beauty of nature. 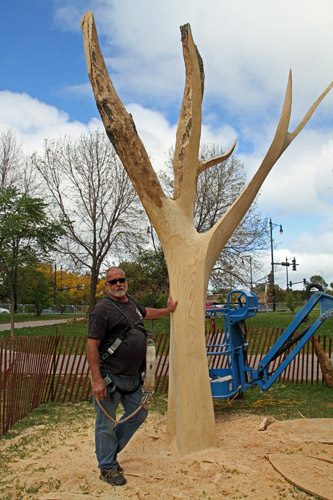 Each Chicago Tree Project artist aims to create an impact on the neighborhood and park visitors. 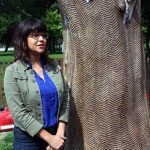 The artists chosen for the Chicago Tree Project include..
Kara James – “Lead with the Heart” – Lincoln Park, and.. 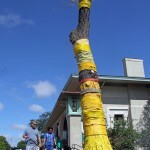 These artists are using a variety of methods to create art including carving, painting and adorning the trees. 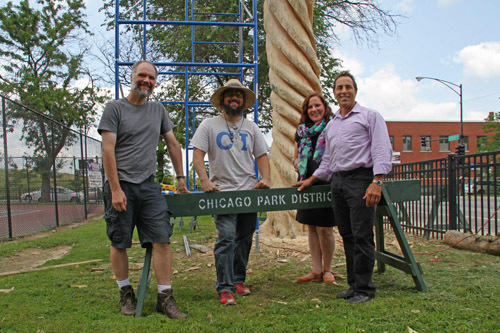 Above image from left: Eric W. Stephenson [President of Chicago Sculpture International], J. Taylor Wallace [sculptor, artist at Chicago Tree Project], Carolyn Bendel [Special Projects – Visual Arts at Chicago Park District] and Michael P. Kelly [General Superintendent and Chief Executive officer of the Chicago Park District]. 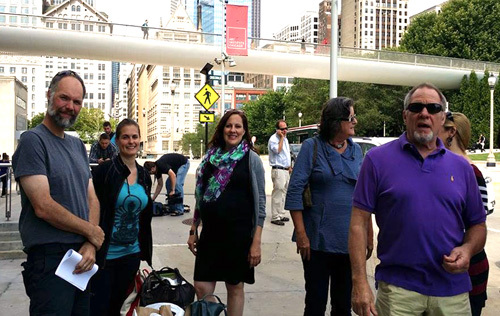 “The Chicago Park District [CPD] strives to integrate art and nature in many ways to enhance the experience of public spaces. 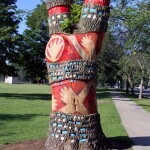 The project builds on the city’s reputation for great public art, and brings the work of local sculptors to a wide array of neighborhoods throughout the city”. – Michael P. Kelly, General Superintendent and Chief Executive officer of the Chicago Park District [CPD]. – Eric W. Stephenson, President of Chicago Sculpture International [CSI]. 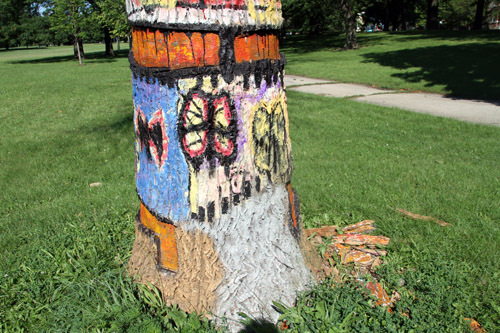 Although the “Chicago Tree Project” officially started in 2014, but in the previous year in 2013, tree-art by local Chicago artists was a part of 31st Street Harbor Project. It was the brain child of Adam Schwerner, who was then the Director of the Department of Natural Resources for the Chicago Park District. Currently he is Director of Horticulture and Resort Enhancement at Disneyland. 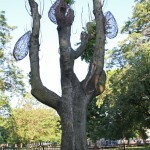 This can be considered Phase I of Chicago Tree Project. For more, on 31st Street Harbor Project, click here.. Above Image: Tree Project tour with members of CSI and CDP..
Lead with the Heart – by Kara James – Lincoln Park, between Foster and Lawrence avenues on North Siminds Drive. For more, click here..
Ron Gard – Lincoln Park. Cheryl Williams in Marquette Park. Nicolette Ross in S. Washington Park. 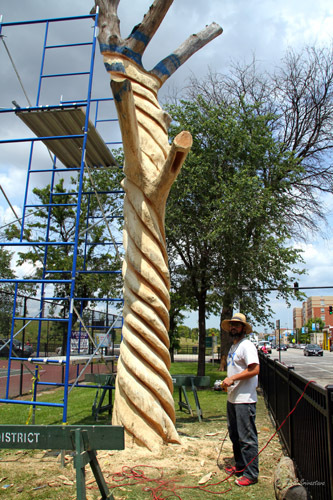 Nicolette is working on Elm Tree, carving it to what looks like a wand woven tapestry. The texture is created by wood carving, hand-inking and hand-painting. Margot McMahon in S. Jackson Park. 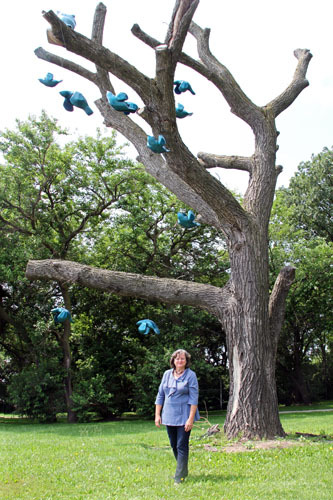 Margot worked on an Elm tree, adorning it with brightly colored, hand made flock of birds. Marc Schneider in S. Bessemer Park. 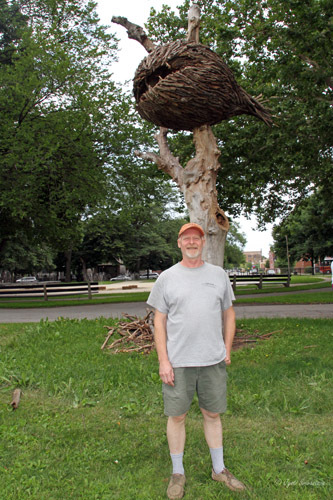 Marc worked on a Maple tree, creating a giant birdhouse of wood, cable, metal plates and hardware. J. Taylor Wallace in Central McGuarne Park. 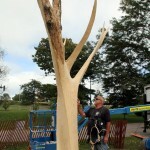 Taylor is working on a Honey Locust tree, carving it into twisting branches that look like cockscrew. The idea is to create whimsy and joy through its spiral design. 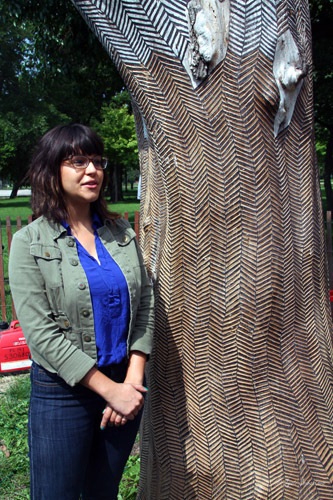 Mia Capodilupo in Central Humboldt Park. 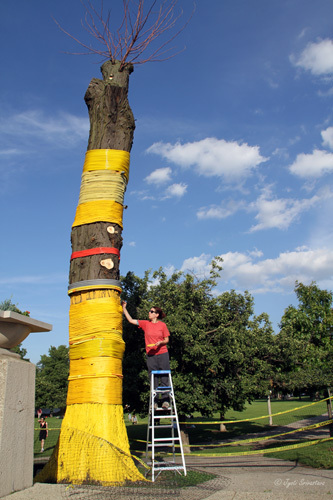 Mia worked on a Honey Locust tree, wrapping the tree using yarn, burlap, rubber tubing, hose, extension cord and textile and painting them into vibrant shades of yellow and orange, linking human and natural creation together. 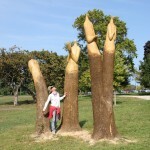 For more details on her work, click here..
Karl and Indira Johnson in N. Olympia Park. 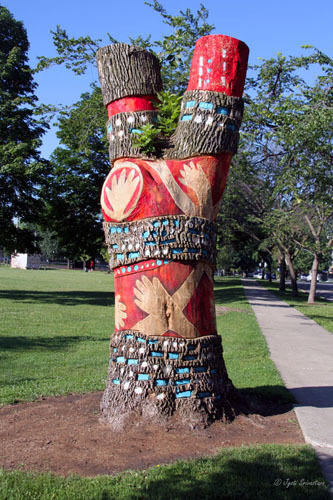 Their work on Ash tree, named SOS consists of overlapping Morse code and outstretched hands, creating a mix of color and texture, reminding of our reciprocal role in caring for the earth. 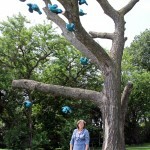 Vivian Visser in Central Armour Park. 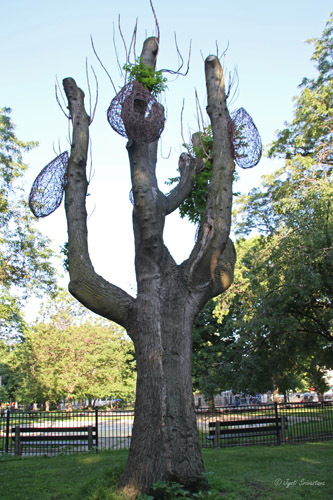 Vivian worked on an Elm tree, adorning it with cocoons, seed pods and hives made of natural materials. 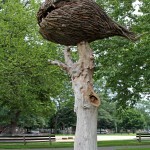 The idea is to enhance environmental awareness through mimicking nature with sculptures. 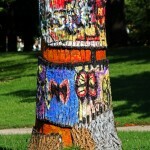 A small four minutes video that gives an idea of the work and artists views of the Chicago Tree Project. Nicolette Ross and Marc Schneider talk about the method used to produce art. Margot McMahon talks about her message behind the art.. and J. Taylor Wallace talks about what he thinks will happen when the work is complete. 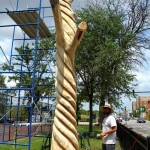 Chicago Tree Project official website.. click here..
31st Street Harbor Project.. click here..